Dig in! Perfect for training and transitioning tots to the grown-up table. 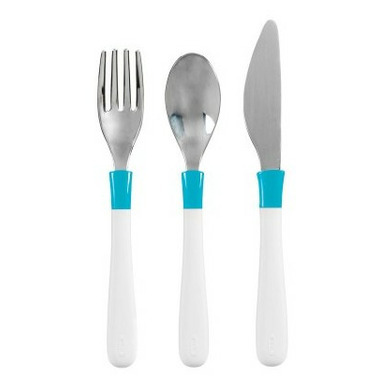 Pretty great transitional cutlery set but the fork could be a little less blunt. I love the spoon coz it holds a good amount of food. Perfect for soups as well! I thought the spoon was a bit big for a 3 yr old but otherwise it looks to be of good quality. My 3 year old LOVES these - super quality!